A similar vase was sold in our New York Rooms, 2 December 1989, lot 398. 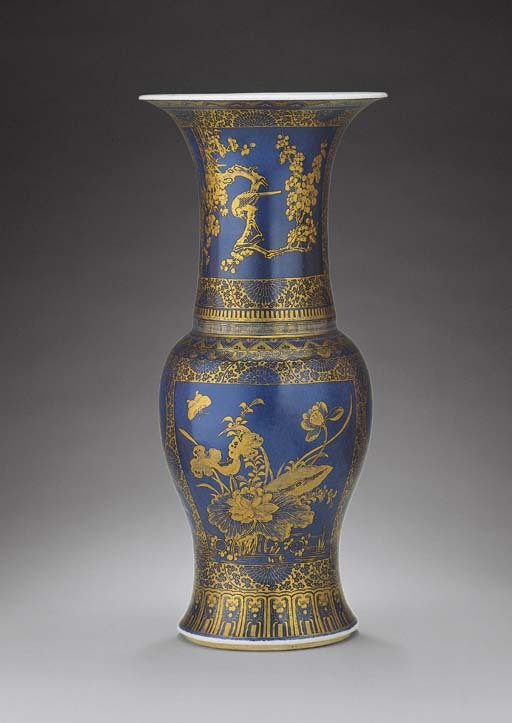 However, yenyen vases with this type of gilt-painted powder-blue-ground decoration are quite rare, as the shape makes the composition more complex. Instead, this style of decoration is more often found on rouleau vases, such as the one with very similar panels of birds and flowers, from the Metropolitan Museum of Art, New York, illustrated by S. Valenstein, A Handbook of Chinese Ceramics, New York, 1989, pl. 243, inscribed with a poem dated to 1709.